M Resort Spa Casino partnered with Gangster have announced that Fiji Water and Hempful Farms will join Heineken and Findlay Chevrolet as sponsors for ROCK INTO SPRING, a three-day pool party taking place April 28 – 30, 2017 at M Resort’s pool. Celebrity guests Chris Adler of LAMB OF GOD, CHINO XL, RAMA DUKE and Grammy Award winning producer Jared Lee Gosselin have also been announced as joining in the festivities. Shakespeare Vodka, No Cover Magazine, Presidential Limousine, and SB Craft Jerky have also come on board to be part of this extraordinary experience. 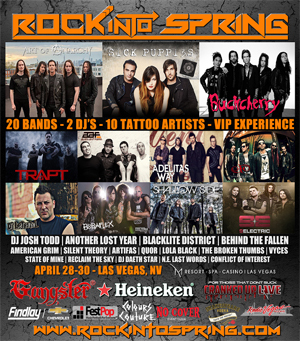 The festival is hosted by Cranked Up Live, Yourlisten.com, The Rocking Comedy Show and Radio Vegas Rocks and will feature live performances from over 22 bands, including: Buckcherry, Art of Anarchy, Sick Puppies, Adelitas Way, Trapt, DJ Lethal from Limp Bizkit, Alien Ant Farm, Eve To Adam, Bobaflex, 9 Electric, Another Lost Year, Shallow Side, Blacklite District, Never Say Die, Alive in Barcelona, State of Mine, Reclaim the Sky, VYCES, Behind the Fallen, Artifas, Lola Black, The Broken Thumbs, QUOR, Silent Theory, American Grim, Never Ending Last Words, Conflict of Interest and more. Single and three day passes will be available starting April 23rd at the box office located at M VUE inside M Resort Spa Casino. VIP Packages are available and feature access to the main M Pool and DayDream, the Pool Club at M Resort: http://rockintospring.com/vip-experience/.